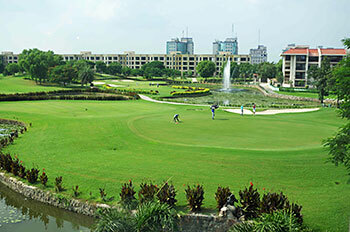 Opened for play in 2000, Jaypee Greens is Greg Norman’s first – and, so far, only – Indian design. Intended as the golfing centrepiece of a 430-acre residential development that lies an hour’s drive from New Delhi city centre via the Greater Noida Expressway, the course is one of the longest in the country, measuring 7,347 from the tips. As is often the case on relatively flat, featureless sites, a number of lakes were excavated to provide soil for contouring the fairways so water comes into play at more than half the holes on the card. Almost a hundred bunkers, many of them constructed in the style of those found on Melbourne’s sand belt courses, provide further hazards. Fairways are grassed with a specially imported Bermuda Evergreen grass that was chosen for its performance and superior playing characteristics and non-playing areas were populated with tracts of woodland, wetland and scrubland, giving the course the natural feel of a private haven set apart from the hustle and bustle outside. The 407-yard 4th is a rather daunting right doglegged hole, where water runs along the right side of the fairway and virtually surrounds the green. On the back nine, the two par threes at the 12th and 14th are especially long and tough and sandwiched between these holes is a long par five featuring an island fairway with alternative routes to the green. The fourth and final edition of the now defunct Avantha Masters was held here in 2013, when Thomas Aiken of South Africa won by three strokes from Gaganjeet Bhullar with an aggregate total of 265, 23 under par.